Winter is in the air, and on the mountains, and piling up on the ground here in Lake Tahoe. It’s the perfect weather to “Build Your Own Ski and Board Adventure” here at Lake Tahoe Resort Hotel. Pick your date, your suite, and your mountain resort through our website. All lodging accommodations include a comfortable two-room suite and daily buffet breakfast so you can fuel up for your day in Lake Tahoe’s winter wonderland. Choose lift tickets to one or more of 11 world-class Lake Tahoe winter resorts, most within an hour of our full service all suite property, or simply walk down the street to Heavenly Mountain Resort to enjoy skiing/riding with spectacular views of America’s largest alpine lake. 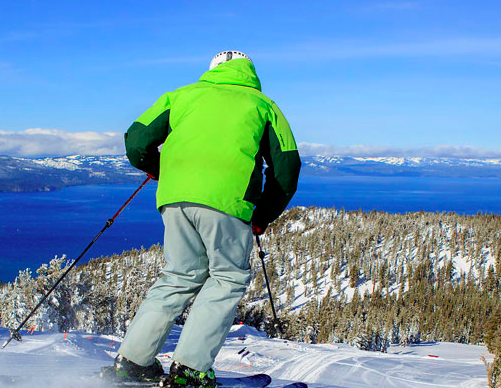 Participating resorts also include Sierra-at-Tahoe, Kirkwood Mountain Resort, Northstar, Mt. Rose, Alpine Meadows and Squaw Valley. Whether you love skiing, snowboarding, snowshoeing or sight-seeing, you can do it all when you stay at Lake Tahoe Resort Hotel. Start designing your own “My Tahoe” winter vacation package. Or call 1.866.916.4653 for more information. Package Restrictions: Minimum 2-night stay. Ski/board packages are booked through BookRenoTahoe.com, a Silvervoyages LLC Company. Restrictions, refunds, and redemption information is provided by Silvervoyages, LLC. If your plans include staying over the Thanksgiving, Christmas or New Year’s holidays, Echo Restaurant has some incredible dining options. Our market fresh, tossed to order salad with all the combinations you can dream up and soup station with gingered butternut squash soup, and assorted Sugar Pine Bakery breads with whipped butter. Our Carving Station features: Cider brined, free range roasted turkey with gravy, orange glazed ham, and herb roasted Black Angus tri tip. Family favorite traditional sides include house made cranberry sauce, buttery mashed potatoes, maple kissed sweet potatoes, sage stuffing, lemon scented green beans and oven-roasted beets. And for dessert we’re offering a Thanksgiving twist – Pumpkin or Bananas Foster with vanilla bean ice cream, pecan pie, cheesecakes and apple crisp. Our Thanksgiving buffet is $32 adults, $10.95 for children under 12. Dinner times are from 4 p.m. to 9 p.m. Please call (530) 543-2144 to make a reservation. After a full day on the mountain Christmas Day dinner will be taken care of by us. The buffet menu includes:Our market fresh tossed to order salad and soup station with carrot and parsnip soup, and assorted Sugar Pine Bakery breads with whipped butter. Our Carving Station will feature slow roasted, grass-fed prime rib with Au Jus, pork loin stuffed with bacon and Bloomsdale Spinach; whole natural slow roasted Tom Turkey with gravy and cranberry relish. Family favorite sides are roasted winter vegetables, Au Gratin potatoes, wild rice, sage stuffing, asparagus with aged balsamic and penne pasta tossed with spinach, roasted tomatoes and virgin olive oil. Desserts make for a sweet ending. Ours will include Apple or Bananas Foster with vanilla bean ice cream plus a tasting of many holiday treats. Our Christmas dinner is $36 adults, $12 for children under 12. Call (530) 543-2144 for a reservation. Ring in the New Year with dinner early at Echo Restaurant, served from 6 p.m. to 10 p.m. The dinner features a starter of iced wild jumbo Mexican prawns with spicy avocado cocktail sauce; gold turnip and red Kuri Squash Cake with Arugula and Cranberry Chutney. There’s Charcuterie with pink pearl apples and Fromage cheese; chilled smoked tenderloin and fresh mozzarella with Chervil vinegar. Our second course is crispy lobster salad with sweet lime and celery root chip served with white balsamic vinaigrette and roasted sweet potato soup with vanilla foam. Our entrée course includes your choice of a 6 oz. grilled natural Black Angus filet and 8 oz. Brazilian lobster with black truffle, garlic and brandy sauce; Chilean sea bass with lemon fennel cream sauce; a natural roasted elk chop with Satsuma tangerine slaw and brandied Kabocha puree; organic baby tomato and roasted Brocoflower Risotto with Yuzu lemon and pomegranate broth; or a 14-ounce natural Colorado rack of lamb with Rosemary Cabernet Jus. Dessert includes a frozen chocolate soufflé with Grand Marnier Ganache and sparkling wine for the perfect New Year’s toast. Dinner is $95 plus tax and gratuity. Call (530) 543-2144 for a reservation.